Barcelona City Council has chosen basic income and housing and assistance for homelessness as the two most important commitments of the city within the 20 principles that make up the European Social Pillar. Barcelona City Council has chosen basic income, on one hand, and housing and assistance for homelessness, on the other, as the two most outstanding commitments of the city within the 20 principles that make up the European Social Pillar. 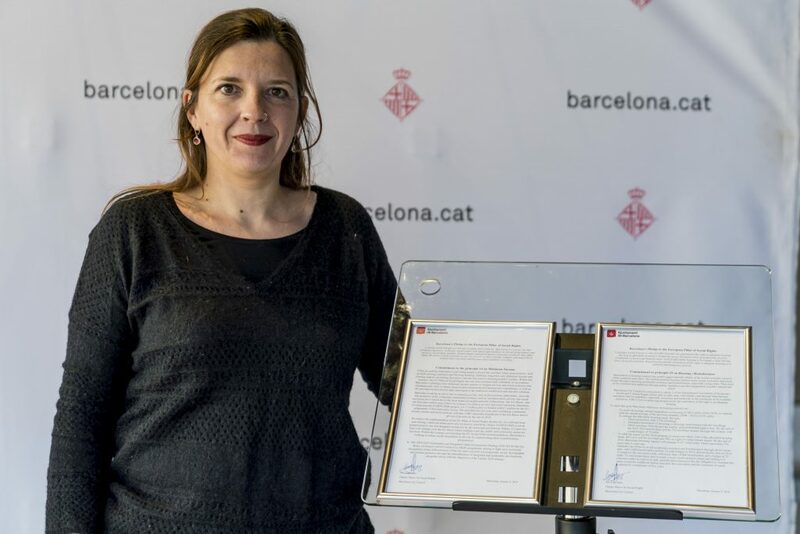 The deputy mayor of Social Rights, Laia Ortiz, has formalized the commitment to these principles with the official signing of the documents. Other European cities are making this same step, in the framework of the Inclusive Cities for All campaign promoted by the Eurocities network, which will be officially presented on February 21 in Brussels at an event that will take place in the European Parliament. It is expected that Laia Ortiz will also attend this presentation, representing the city of Barcelona and also as president of the Social Forum of the Eurocities network for two years, until last November. During this period, Ortiz has led the demands of the municipal movement to make the European Social Pillar an effective tool with tangible repercussions in the defense of social rights in cities. The European Social Pillar, approved by the European leaders in November 2017 at the Gothenburg Social Summit, establishes the 20 basic social principles and rights that should guide political action in Europe to achieve the most equitable labor markets and social protection systems possible. The double commitment of Barcelona (the 14 principle of minimum income and the 19 of housing and assistance to homelessness) has to do with very specific factors and social policies promoted in recent years in the city, as is the case of the project B-Mincome to test the effectiveness of promoting minimum income, or the reserve of 30% of social housing in the new promotions and the record investment up to 35 million euros per year in assistance to homeless people.